For many of us crackers are an important part of daily life. From breakfast to all-day snacking to hosting outrageous and/or classy parties/sorties, crackers are there for us. Remember when you were a kid and you were sick? Your mom gave you crackers. Remember when you wanted to eat a brick of cheese but felt socially embarrassed to just go for it? Crackers. Crackers aren't usually expensive--maybe a few dollars for a box--but there are so many varieties that you'll never try them all. Even such a small investment can be a huge risk when it comes to crackers. What if you don't like the flavor? There is so much that can go wrong. The possibilities for failure, like varieties of crackers, seem literally endless. That's why I'm here. To taste your crackers for you and then give you an indication as to whether or not it's worth buying and eating that variety of cracker. But the decision to do so is still up to you! That's the beauty of free will. Or is free will an illusion? I'll have to ask my psychic what she thinks. There's one thing that I don't have to ask my psychic about, though, and that's a question of how thorough this review will be. The answer is: quite so. A secondary effect feature of a rambling incoherent thoughtful and thorough review is length. Thank Al Gore (inventor of the Internet) for jump breaks. Click on, brave reader, to the full review! Front of cracker box. This is what you will see in the store on the cracker shelf. People go to school for years for the opportunity to design cracker boxes. Whole teams of people decide on what a cracker box should look like. The above image is the result of hours upon hours of work and meetings; late nights and deadlines. Looking at the box will tell you a lot about the cracker, even if it tells you nothing. How many fonts can you count? How many typefaces? And it's not even until the bottom of the box that the reader knows that this is a box of crackers. I mean, besides knowing what one of the most popular crackers in the world is named (Triscuit) and also finding it in the cracker aisle. But if you didn't know, you might think it was a box of cheese, or a wood platter for serving cheese. Well it's a cracker. Obviously it's a square cracker. Look at the dots on the i's in Triscuit. 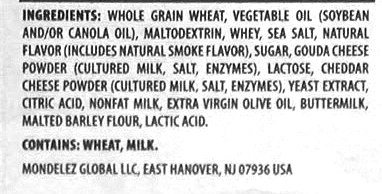 Look at the square behind the Triscuit label. 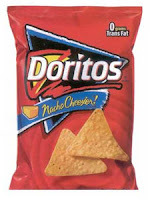 They pulled that design concept straight from the pages of Doritos (see: Exhibit A). Look at the large orange-red square with jagged cracker-like edges advertising SMOKED GOUDA. I was hoping that the box designer had enough wherewithal to make the orange square the actual size of one of the crackers, but alas. The orange square is larger. I want to add a short paragraph here for formatting reasons. So I will draw your attention to the NET WT of 9OZ on the box. Triscuit varieties can, uh, vary in their content's weight so your price per cracker can change depending on which flavor you buy. 9 ounces is the same as a standard box of unflavored Triscuits, though, so you aren't being scammed here. Never buy the REDUCED FAT TRISCUITS. Those are only a 7oz box and they taste worse (somehow both chewier and drier). Also in small type toward the bottom is a sentence implying that if you only eat Triscuit crackers and eat them in moderate quantities, your heart health will improve. Then they show you just what you're getting health-wise in a 6 cracker serving. Only 120 calories! You would only have to walk approximately 1 mile to burn off the calories in 1 serving of Triscuit crackers. Most of all, however, check out their serving suggesting. Stack up four crackers and then top them with pear, bacon, and pepper jelly. Yeah I'm going to put that much effort into eating crackers. I mean, how would I even go about creating something like that? Luckily, the clever people at Nabisco thought of that and included directions on the side of the box. Build "delicious" in three easy steps. Let's follow along with those instructions to see how easy it really is to arrive at delicious. i. What even is hot pepper jelly? Where do I get this? It's definitely not something I already just have on hand in my refrigerator. As you can see, there are some sub-steps to "delicious" that aren't quite as simple and quick as the box would have you believe. None of the steps include cheese. Presumably you won't need it because the cracker already tastes like cheese. That's why I bought these right? Because I'm too lazy to add even a slice of cheese to a regular cracker. Why go through all that trouble? Additionally, it bothers me that Triscuit tries so hard to convince you that there are so many great things you can do with a Triscuit cracker. It's like they have low self-esteem and think that the cracker can't stand on its own, but needs to be made into a mini-pizza or tapas or something to be enjoyed (how come it's enjoyed and not enjoied like the past-tense of other words that end with y?). The signature of a good cracker is its ability to be eaten singularly without all the fixin's. Nabsico: why put all the effort into making flavors if you are supposed to add toppings anyways? Just get a regular Triscuit and add a slice of Gouda cheese before completing the 3 easy steps to delicious. I want to look Triscuit Cracker in the eyes and tell her, "you ARE good enough. You are already a delicious, flavorful snack. Now get out there and show 'em what you got!" You probably can't tell in this photo, but this print job is out of alignment. I hope someone was fired. The rear of the box shows another unnecessary recipe to turn your crackers into "pizza" with Brussels sprouts. As Rachel Ray would say, "mmmmmmunnnnghhh! mwaaah! delish!" This recipe appears to be more complex because it doesn't tell you how many easy steps there are and it involves using an oven. You might want to ask your parents for help with this one. Are These Crackers Health Food? Now it's time to face the jury. Is this snack food going to give me a six-pack of abdominal muscles, or is it going to engorge my succulent fupa? I'm talking Nutrition FACTS. They're listed right on the side of the box. 54ish crackers per box. This box has a normal Kroger price of $2.77, though is frequently on sale. So that's about 5.13 cents per cracker. If a guy approached me in the streets and offered me a single cracker for the "low low" price of a nickel I'd tell the guy to get lost. It really makes you think about the value of a dollar. Thanks, Obama. Legalize $15/hr min. wage! You don't need me to sit here and type at you all the values listed on the box. Just go ahead and click on it, you savvy consumer, and find out how eating an entire box of crackers all at once will affect your health. Just keep in mind that these nutritional FACTS are before you add all of the ingredients for your Brussels Sprouts pizza crackers or pepper jelly bacon pear crackers. Bacon, for instance, is known to be high in fat content. And sodium. Bacon will give you stomach cancer. That is a FACT. Of What Are These Crackers Made? Pretty interesting IMHO. FYI, Std. Triscuits are wheat,oil,salt. So everything else you're reading is to make that juicy, creamy, smoked Gouda cheese flavor and/or stabilize the flavor additive. Here is a youtube video on how to make your very own liquid smoke extract. You'll notice that the box mentions nothing about cheddar flavors, yet there it is right in the ingredients. It is also interesting to note that they use yeast extract and malted barley flour to contribute to the aged/fermented cheezy flavor. Conceivably, a person so motivated might be able to brew a beer with these crackers. There's one last thing I want to show you on the box before we start eating these and reviewing the actual cracker. Check out the "Best by" date on the lid of the box. Notice anything? Maybe a familiar looking date? I swear someone from the government is monitoring everything I do. They are following me and silently influencing my life. But also giving me clues, as a subtle way to mess with my head. Look at that date: 21 September 2016. If that seems familiar to you it should. Remember 11 September 2001, aka 9/11? Aside from Europeans invading the native Americas, the 9/11 attacks on the World Trade Center buildings in NYC are the largest foreign terrorist attacks in America . Ten days. Fifteen years. 01-09-10-11-15-16...The numbers are there. You do the math. Finally, right? I promise I don't get paid per word. 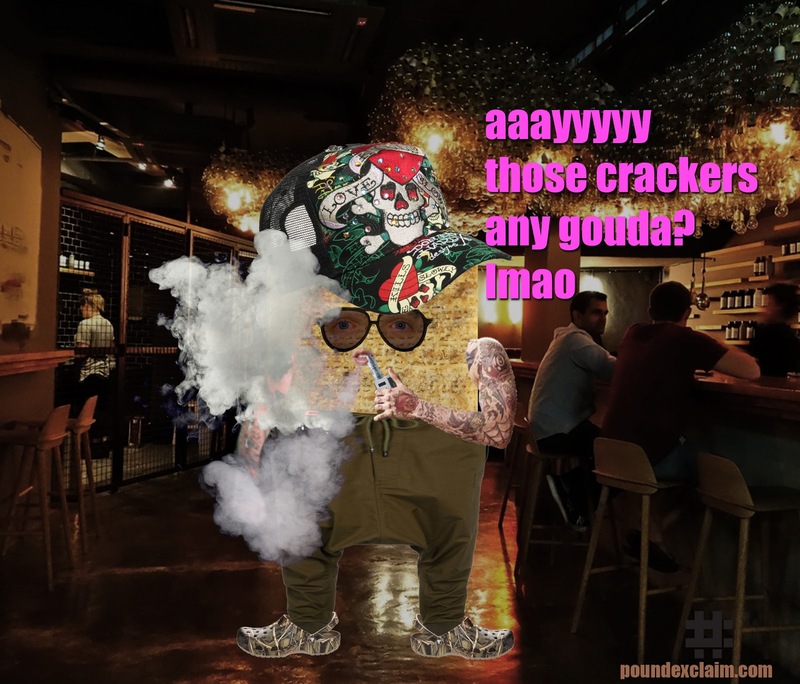 I am just really passionate not only about Triscuit crackers, but also the lifestyle of the cracker subculture. I'm on a single cracker per day diet. It is terrible. Like most normal, civilized people I put my crackers onto a plate before eating them. Only an animal would eat a cracker straight from the box or put them into a trough bowl. Were you raised in a barn? Let's get a closer look at these fine specimens. Appearance: These look like standard Triscuits. They are square with each side measuring, probably, about 1-3/4 inches. The crackers have that signature weave of wheat, making them look like tiny flat baskets of sorts. The color is the same golden brown as regular Triscuits and appears to be relatively unchanged from the addition of flavor powder. You can also see flavor powder, as noted above. Aroma: You've got to get these right up to your schnoz to smell them and find a patch of flavor powder to really get a whiff of the good stuff. It smells smoky and almost like ham. Maybe we can call it a hickory smoked ham aroma. If I close my eyes and pretend I'm at the cheese store then, yeah, it smells like smoked gouda cheese. I can almost see the dark brown rind in my mind. There isn't any kind of distinctive cracker aroma that comes through the flavor powder. Finger Feel: The crackers are slightly oily, but leave more flavor powder on your fingers than anything else. It isn't like Cheetos level of finger powder. Not even as bad as some of the other flavored Triscuits. You'll probably want a shirt sleeve nearby, though, especially if you are doing something else with your fingers. Although, I guess there would be less powder on my fingers if I were eating these properly--as in, picking them up by the sides (off my plate) to keep the Brussels Sprouts Pizza from sliding onto the front of my really nice shirt (the sleeves of which I am using to wipe my dusty gouda fingers). Taste: These actually taste a lot like smoked Gouda cheese. If you chew one up and let it sit in your mouth, the inside of your mouth thinks it may have eaten a Triscuit with a slice of smoked Gouda on it it--flavorwise. This is more than I can say for some of their other flavors. The Brown Rice Tomato and Sweet Basil Triscuit crackers, for instance, are gardeny and herby and definitely are evocative of those flavors, but it still tastes like powders of those flavors and not the actual taste of eating tomatoes with basil. So they did pretty well with the Smoked Gouda. Mouthfeel: Right away your mouth knows it's eating a name-brand cracker. It has the same familiar crunch as a regular Triscuit which is far superior to store-brand woven wheat crackers. The cracker breaks up easily under tooth pressure and is just oily enough to not absorb all of your saliva and dry the mouth. Having the flavor powder on there is a little off-putting. I don't like it on initial cracker entry. Once it is mashed up after a few chews is when it feels best in my mouth. Yes, you feel like you ate a cheese covered cracker when all you've really done is eat a plain cracker. Overall: I would say that overall this is an unnecessary addition to the Triscuit portfolio of flavors. It is nice they added a cheese instead of another frou-frou "Tomato-bisque au lait avec les parsnips de jardin" kind of flavor. And they did this one pretty well, as flavors go. It's just the powder, you guyz. That ruins it for me. I like the flavors where another herb or spice is integrated into the grain of the cracker itself. Like the Rye with Caraway Seeds flavor. Otherwise, don't mess with it. Stop trying to make crackers into chips. Don't cross the aisle. Get your ideas team in check, Nabisco. Or should I say, Mondelez Global LLC? I need to cross reference the Panama Papers to see what this Mondelez corp is up to. I didn't have any pepper jelly, bacon, pears, fresh Brussels sprouts, or ricotta cheese on hand to try out the box's recommended recipes. But I couldn't just eat plain crackers all night now could I? I tried it with a small slice of Colby Jack cheese. It was an improvement. Because the Gouda flavor bonds to the real cheese to give a better overall mouth experience while retaining the custom Smoked Gouda flavor. Plus, it's cheese y'all! Next, I tried it with fresh avocado. Most of this avocado was brown and over-ripe, otherwise I totally would have used a more attractive slice. This tasted really good. The creaminess of the avocado is a great balance to the powdery cheese. If I closed my eyes I might be in Chile, or wherever avocados and cheese are popular. California? Then I had to try it with both cheese and avocado. This was less good than each ingredient separately. There was too much going on--too many competing textures. This was so Cali tho. Should I start surfing? I'm so left coast. Would a couple drops of Tapatio bring this Triscuit to the next level? Not really. This wasn't that great. It's certainly no oyster crackers and Skyline hot sauce. Yeah you heard me, Gold Star. Hot cheese was a good idea. Has melted cheese ever been a bad idea? This one tasted really good. I recommend Smoked Gouda Triscuit nachos. Then I started running out of things to put on crackers. I considered a slice of mandarin orange, but didn't want to commit to peeling an entire mandarin for this project. Ugh, I know, right? I thought about putting a slice of buttered toast on a cracker just to be ridiculous and reach my carb goals, but again: too much effort. Now that I think about it, there is probably a person or team of people whose entire job is to create the fun easy recipes that go on a box of crackers. How can I break into that scene? There are many fun and exciting flavors of Triscuit crackers and exponentially more options for eating the crackers. The Smoked Gouda flavor is a solid effort by the team of flavor scientists at Nabisco. I probably won't get this flavor again, though, unless I'm throwing a Triscuits party. Stick with standard and add your own flavors from real life food. Powder isn't food. And it has driven me totally nuts to write "Triscuit" so many times and each time it has a squiggly red line underneath suggesting that I change it to biscuit or tracksuit. And that apparently Gouda and Brussels must always be capitalized. I totally forgot to write a section about puns and am not motivated to go back and work it in. Like: will these be any Gouda? Or maybe something about Vaped Gouda instead. Oh and I could have a hilarious cartoon of a cracker vaping. I'll have to through this up on Craigslist's Missed Connections and see if I respond to myself. Went ahead and made it while you were waiting.